How investor can file consumer complaints? 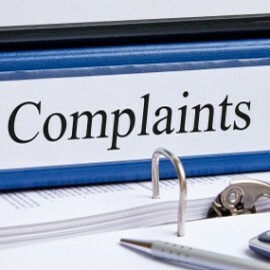 Home » Investment » How investor can file consumer complaints? How to file consumer complaints? Misselling of financial products is very common today. It seems it is very easy to convince customer for purchasing any products. Recently my friend called me up and he told me that he is a victim of mis-selling of insurance policy. He is confused and don’t know what to do now. Similar to my friend you might come across a situation where you felt disturb about mis-selling, cheating, faulty product or dissatisfaction in services. In order to help you, I am herewith step by step guide How Investor can file consumer complaints? Step-1 – If you have any complaint or grievance about insurance, approach the grievance cell of the insurance company first. Find out detail about Grievance Redressal Officer (GRO) of an insurance company. In order to help you, a list of GRO along with contact detail is given here. Step-2 – Give your complaint in writing along with support documents. Take written acknowledge of the complaint. If you have not received policy. There is dispute regarding premium paid or payable. There is delay in claim settlement. Your claim is partially or totally rejected. There is a dispute regarding the terms and conditions of the policy. Step-1 – For any delay in stock deposit or cheating about stocks or mutual funds you can contact customer care or service center of fund house or company. Step-2 – If you are not getting proper response or support for one week you can take it up with SEBI. SEBI has established Sebi Complaints Redress System (SCORES).You need to visit https://scores.gov.in and file your complaint. You can file and track complaint status from this website. Step-3 – If you are still not satisfied with verdict or answer you can approach consumer court. The Complaint related to issue and transfer of securities. Nonpayment of dividend with listed companies. Dissatisfaction against various intermediaries registered to SEBI. Step 1 – Real Estate regulation bill is passed but yet regulator authority is not established, so incase of any complaint about real estate first step is to give the complaint in writing to a builder or to real estate company. Step 2 – If your issue is not addressed contact nodal agency like CREDAI and NAREDCO. Step 3 – The final option is to file complaint to civil and consumer courts. Step 1 – First step in consumer complaints against the bank is to contact customer care department or grievance cell. Step 2 – If your complaint remains unanswered contact to banking ombudsmen. You can get contact details of banking ombudsmen in your area from RBI website. All banks including corporative bank, schedule bank, commercial banks are covered by banking ombudsmen. Step 3 – You need to file a complaint by writing on plain paper or by sending an email mentioning all details. Step 1 – Contact customer care number of the company. Get detail about complain number. Step 2 – Give complaint in writing mentioning all relevant details. Keep a log of all communication regarding a complaint. If your complaint is not getting an address, send an official email to the company. A defect in Product or deficiencies. If the product is hazardous to life and safety. Unfair trade practice adopted by seller. If seller is charging extra price with respect to MRP. Any malpractice or deficiency in services offered. Hope you find this post useful. Do share your experience with me. Take an informed decision and voice your complaint if dissatisfied. How to make a complaint against Insurance Company?